A Philadelphia Police officer was injured Saturday evening in a fiery hit-and-run accident in Grays Ferry. It happened just before 5:30 pm Saturday at 28th and Tasker streets. Officer Mark Kimsey's cruiser was involved in a crash with pickup truck causing the police vehicle to catch fire. Kimsey was trapped inside the cruiser and neighbors on the block quickly came to his assistance, pulling him through the window before it burst into flames. He was rescued by 17-year-old volunteer firefighter Joe Chambers and another neighbor who both heard the crash and came outside to see. A passenger in the pickup truck was also injured, however the driver took off on foot down Tasker Street after the accident. Kimsey and the passenger were taken to Hospital of the University of Pennsylvania. UPDATE: The 52-year-old man pulled from the pickup truck was the driver, not the passenger. Eyewitness accounts of the driver running off were incorrect. 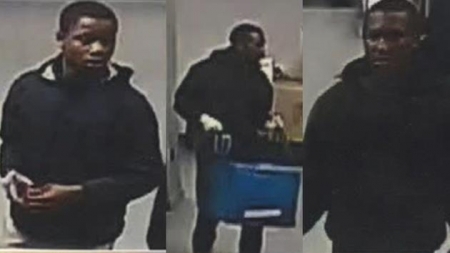 Police are looking for three suspects caught on surveillance cameras looting and vandalizing a Philadelphia charter school of Friday doing thousands of dollars worth of damage. (see photo below) It happened around 9:45 p.m. at the Eugenio Maria De Hostos Charter School on the Aspira Education campus on the 4300 block of North 5th Street in Olney. School maintenance workers discovered it the next day. The suspects ripped apart rooms, tossed papers, defecated and urinated on floors, and stole fundraising money from the main office. They also stole at least five computers. The school is working on cleaning up and repairing the damage as well as improving security for classes to start again on Monday. Anyone with information is asked to contact Philadelphia Police at 215.686.TIPS (8477) or text a tip to PPD TIP (773847).